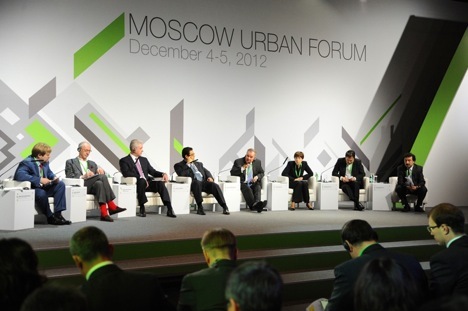 The third annual Moscow Urban Forum will be held in the Russian capital on December 5-7. The annual conference on urban planning, urban studies and related disciplines is held with the support of the Moscow government. The 2013 edition of the Moscow Urban Forum will bring together about 2,000 participants, among them Russian and foreign investors, members of the Moscow administration and bureaucrats from major world capitals. More than 30 internationally acclaimed experts in urban studies will participate, including former Mayor of Bogota, Colombia and the Head of the Board of Directors of the US-based Institute for Transportation and Development , Enrique Penalosa, expert in suburban development, Ellen Dunham-Jones, and the co-founder and 'chief eternal optimist' for Architecture for Humanity, Cameron Sinclair. The main theme of the forum is ‘Megacities: development outside of the centre.’ Most of the population in large cities live outside the centre, so the development of peripheral areas of big cities has become extremely important. This will be discussed by the participants, who will try to answer the following questions: how to identify and increase the value of the urban fringe, how to solve traffic problems, what approach to use for adequate development in view of modern realities? Where to look for points of growth: in recently attached territories, old communities, industrial areas or satellite towns? The first day will be devoted to international experience of peripheral development in big cities, while Moscow will be discussed on December 6th. Experts will assess some urban rejuvenation projects, published online at moscowidea.ru. The resource was launched in July this year by one of the Forum organisers – the Strelka Institute for Media, Architecture and Design. During three months, Moscow inhabitants could post on the site about what they would change in the city. The best ideas were taken up by architects and designers, who will present their projects at the forum. Finally, on December 7th, a city festival of urban studies will for the first time be held within the forum. The festival consists of exhibitions, discussions, round table talks, lectures, workshops, film screenings and programmes for children. Events will be held in more than 20 locations beyond the Garden Ring. A full schedule of events and an interactive map of events can be found on the Moscow Urban Forum website.